It is decidedly a nerd biography. iWoz: From Computer Geek to Cult Icon: How I Invented the Personal Computer, Co-Founded Apple, and Had Fun Doing It by Steve Wozniak (the true creator of the original Apple) and Gina Smith, shows how Woz thinks, eats and breathes like an engineer. Most of the high points in his personal narrative revolve around moments when he figures out how stuff works, gets stuff to work, or executes some offbeat prank. Co-author Gina Smith joined Will Block and myself on the NeoFiles Show to chat about all things Steve. Smith herself has a great history in tech reportage, including ten years writing "Inside Silicon Valley," a column for the San Francisco Chronicle, and six years as the technology correspondent for "World News Tonight with Peter Jennings." The wonderful wizard, Woz himself, has said he would come in for a follow up show, and we intend to hold his feet to the fire. Literally. But in keeping with Woznakian ethics, we'll remove his feet long before a harmless prank crosses over into the realm of cruelty. To listen to the entire interview in MP3, click here. RU SIRIUS: "iWoz" is not a conventional biography where you might expect some pathos, some childhood trauma, or whatever. It's totally an engineer's biography. The major scenes are the ones where he figures out how something works. GINA SMITH: One of the first things he told me in our interviews was that he had never understood what his dad did for a living. Around the house, it was this big secret. And what dad did was — he was designing the Polaris missile. It was super high-tech, top-secret stuff that he couldn't talk about at home. In a way, that's what drove Steve to be an engineer. He wanted to understand the stuff that his father couldn't talk about. In his childhood, he became fascinated with this world of transistors and resistors and diodes and putting together little projects. He was this little 200 IQ geek in 1960 California. RU: And his father really encouraged him. GS: His dad was sort of a teacher for him. He would use a blackboard. And while his dad couldn't really get into it with him about what he did for a living, he was happy to say, "OK, here's how electricity works. Here's what a vacuum is. Here's an electron. Here's what happens when an electron goes through a wire. Here's what happens when it doesn't. This is a one and this is a zero." He's showing Steve how an AND gate and an OR gate works — the basic fundamentals of electronics. He explained all of that to Steve before he was even out of fifth grade. RU: And he explained it all it in a way that helped him become an engineer. He started at the bottom of the process. GS: That's how Steve explained it. He'd ask something like, "Well, how does a computer work?" And his dad wouldn't say, "Well, here's how a computer works." He would say, "Well, do you understand how electricity works? Because without electrons, there's no computing. Do you understand what an atom is? Let's look at the positive charge and the negative charge and how these things flow." And from that bottom, he would go all the way up until Steve truly understood, from the basics, how computers at that time worked. WILL BLOCK: What comes across in the bio is an incredible purity, innocence and delight in learning how the world works. GS: That's what the tapes of my interviews with Steve sound like. It's all, "Wow! And then I was able to develop the Apple I, and... Wow! Then I was able to add color, and... Wow!" He hasn't lost that innocence. He hasn't lost that sense of enthusiasm. When he looks back, you can see that youthful kind of vigor in his face. RU: He won a sixth grade science project by doing something kind of amazing. GS: He essentially built a giant calculator in the 6th grade. This was before handheld calculators. It added or subtracted numbers. And basically, that's all a computer needs to do in order to do everything else — it has to add and subtract. The judges took one look at this thing and he was awarded a ride on a jet. He was always known as the science and math whiz, since he was five-years-old. What my editors at Norton wanted answered in the book was, "Why Steve?" Why did he get to be the one who invented the personal computer and not a myriad of other people? And that's what we tried to answer. Well, Steve was always miles ahead of his peers in terms of understanding electronics. WB: Timing has a lot to do with computers and seems like a good metaphor for why it was him. He came into a unique environment with a lot of enthusiasm. GS: Now we have to include Steve Jobs in this discussion. Steve Jobs looked at this little invention that Steve Wozniak has come up with. It was essentially a board that allowed you to input data using a typewriter keyboard and output it using an RCA TV screen — it had to be the RCA. Steve Jobs looked at this and said, "Hey! I bet we could make fifty of these! And sell 'em!" RU: The sound of ka-ching is heard by Steve Jobs. 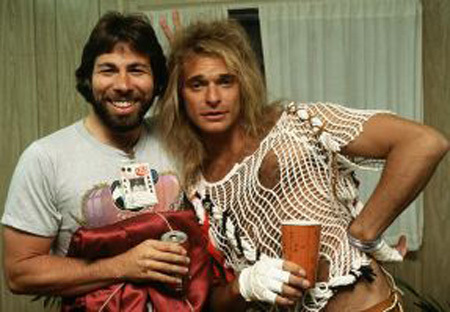 GS: He was only 21 years old, and Steve Wozniak was 26. Steve Wozniak's dad thought this was all very funny. RU: What was it like working with Woz? Was it hard to get him to tell his story? Did you have to do a lot of coaxing? GS: It was a lot of coaxing. I met him through a friend of mine who had met him at a Grateful Dead concert. I said, "I'd love his email address." Because when I started covering technology in 1988, Steve Wozniak was already gone. He was out of technology, so I never had a reason to interview him. able to get a writer to do his voice. So once we had our deal; in my mind, I was scared to death we were going to have to send the money back. This is how I make my money — writing books! Maybe Steve can send back a big advance, but I'd have to sell the house! So I was very very careful, in working with him, to always go over the chapters and make sure that he was always aware that I was trying to make it sound exactly like he speaks. That has gotten us a little criticism because people read it and say, "Hey, it sounds like somebody's talking!" RU: It has an "As Told To" flavor. But that's who he is. GS: That's what it is! RU: Did you ever want more "blood on the tracks" from him? More heaviness? GS: Yes. We met two or three times a week for a year, and we either met at a coffee place called Pearls in the West Portal district of San Francisco, or we met at the Hickory Pit, which is a barbecue place in Sunnyvale. I'm a vegetarian, and I spent the whole year smelling meat and talking to Steve Wozniak. I thought we'd get all this kind of dirt, politics, Steve Jobs... what was going on in the early days of Apple. And what I quickly discovered was Steve Wozniak wasn't privy to that. Steve Wozniak was an engineer whose head was in a breadboard. He wasn't paying attention to what was going on. They put him in a building all by himself and said, "Complete the floppy drive." So in terms of the down and dirty politicking happening, there's not a lot of new stuff. RU: I like the story about how they named the company Apple. Most people assumed that it was the influence of The Beatles. But there's a great story about Wozniak picking up Jobs at the airport. GS: Talk about coaxing; it took me probably eight months to get Steve Wozniak to tell me how the word "apple" came up. He was resistant to talking about it. And finally, the story came out. He had picked Steve Jobs up from the airport. And Steve Jobs had been living in a commune up in Oregon that was an apple orchard. So that was just the name that popped into his head, coming out of the commune — apple. And they both loved it. And think about how fresh that name was in 1975. They had the immediate concern — what about Apple records? RU: ...which only recently became a problem. GS: Steve Jobs said "No, that's music. This is computers. How could that possibly be a problem?" GS: If you look through history, a lot of geniuses and people of this ilk have also been pranksters. I couldn't get Steve to stop telling me about pranks. In fact, most of the time, I wanted to get all this Apple stuff, and he wanted to talk about the time that he pretended he was Henry Kissinger and called the Pope. And I'm like, "This is funny, but I want the Apple stuff in the book." He could do a whole book of pranks. RU: He did his first prank when he was very young. RU: He evolved and developed a taste for pranks after that. GS: I think it's a way of dealing with his shyness, too, He talks a lot, and he talks rapidly, but he's very shy. These pranks are a way to get people laughing, get people comfortable. We used to spend the beginning of almost every interview with, "Pick a card, any card." I'd be doing card tricks with him. And I'd be like, "O—kay. When are we going to get to the interview?" And he'd be, like, "Look at my lasers and how I can put them through my ears!" And I'd be, like, "O—kay! When are we going to get to the interview here?!" WB: A prank is a form of creativity, and it continues on and on since you get to tell people about it again and again, so you revivify it. That's the kind of spark of creative genius that some need as a trigger. GS: One of my favorite pranks that he talks about in the book took place right around the time of the Altair. That was a kit computer that made Bill Gates a bit famous — writing a version of BASIC for that. So there was a big computer conference and Wozniak went through all this trouble to create these fake fliers for a computer called the Zaltair, because there was an operating system at the time that started with a Z. So it had all these Z jokes in it, but if you looked at the very first letter of every word in the topic sentence, it spelled out a competitor — P.r.o.c.e.s.s.o.r T.e.c.h.n.o.l.o.g.y. And he tricked Steve Jobs with this. It was fifteen years before he handed a copy of the flyer to Steve Jobs and said, "I was the one who did this." He's a prankster. I had a lot of salt in my coffee, a lot of red pepper in my eggs. And I was not going to show him that it bothered me, so I drank salty coffee and ate peppery eggs for a solid year without even blinking. instead of paying like a normal person and giving them the cash; he holds out these long rolls of perforated two dollar bills and says, "How much is it? Okay, let's count down" 2, 4, 6, 8... Okay, I'll tear right here!" And at this point, the woman or the man behind the register always says, "That's not real money. We can't accept that." And of course, it is real money, it's just how he presents it. We were at our mutual friend's wedding and he was selling two dollar bills off in the corner. And he was making a profit. He was selling these two dollar bills for three dollars to people, and telling them that the two dollar bills weren't real. That's part of the trick. People walk away with these wads of money that they'll never spend. But I spent my two dollar bills on a lot of Starbucks. I needed coffee that didn't have salt in it, so after I left him, I'd go to Starbucks. RU: There's a connection that lots of people in this culture would make between the spirit of pranking and the whole thing with phone phreaking. And it's widely known that the development of Apple was tied in with blue boxes. GS: Steve Wozniak was really one of the first phone phreaks ever. When people hear that word, phone phreaks, who do they imagine? Maybe someone who has done prison time. But back in those days, very few people knew the secrets of the phone company, and how to make a free call. All phones were rotary back then. He was able to develop a little box that you could attach to a payphone that would get the operator; open up a line, and then he could call anywhere. Steve was really into ethics. So he felt he didn't want to do this as a way to save money. He wanted to do it to have fun. Like he tried to call the Vatican, and tried to get a call in to the Pope, saying he was Henry Kissinger. You know, "Tal-king vith theees ac-cents," saying "Hel-lo, this is Henry Kissinger..."
RU: It was 5 a.m. in Italy when he called. GS: Yeah. And he and Steve Jobs made a little business of this thing. They were kids. Steve Jobs was maybe 17 at the time and Steve Wozniak was four or five years older. They were selling these blue boxes. You can bet that the people who were buying the blue boxes weren't quite as ethical. RU: Now we're into the "outlaw roots" of Apple. Whatever Woz thought, the Phone Phreaking ethic was pretty much a Yippie thing. For a lot of them, it was about intentionally ripping off corporations. It was an anti-authoritarian thing. Woz was sort of half-in and half-out on that sort of thing. He was in the middle. GS: He talks about his ethic. He says the Phone Phreaks weren't about ripping people off, they were about exposing flaws in the phone system. And then he's into the Homebrew Computer Club. They had this ethic that big companies shouldn't be the only ones with computers. The idea was, "We're taking the spare chips from the warehouses of the companies where we work, and building computers for ourselves." So you're right, they were kind of walking a line between ethics. RU: He really admired Captain Crunch — John Draper — the great phone phreak. GS: He actually wrote the first word processor for the Apple computers from his cell in prison. And then, in the '70s, he ran several pirate radio stations from his van. This was very cutting-edge crime. RU: In a way, there's a hint of that sixties radicalism in Woz, but in a very moderate form. GS: He walks the line, You really see that throughout the book. Like, he put all that salt in my coffee. Finally at the end, I said, "Look, you know. How much salt have you put in my coffee?" And he said, "No, I haven't." And I said, "What is this ethic you have about not lying? You should be honest, because I know salty coffee, I've been drinking it for a year." And he said, "A prank is different than honesty. If it's a joke, you don't have to tell the truth." And that's walking the line. In the book, Steve talks about when he was at Berkeley and Captain Crunch was coming to meet him. He's a kid and he idolizes Captain Crunch, and he expects this really dashing, suave character to come in because that was the impression he'd gotten from the stories he'd read. And then Draper comes in and he's missing most of his teeth, his hair is all greasy, he's smelly. The lawyers at Norton books asked, "Are you sure we can say all this stuff about John Draper? Couldn't he sue us for saying he smells and he has no teeth?" And Steve said, "Well he does smell and he does have no teeth." And we checked it all with Draper, and it was okay. "Yes, this is how I was in 1974." RU: We should talk a bit about Apple's success and Wozniak's disillusionment with some of Jobs' actions. That's a theme — the relationship between Wozniak and Jobs. GS: I really had to coax these stories out of Steve. I did a lot of research before I actually started interviewing Steve, and I'd read this story in some book about Steve Jobs allegedly ripping Steve Wozniak off on a version of Pong called Breakout that they were doing for Atari. Jobs told Wozniak that they were getting paid one amount, but really they were getting paid much more. And so I asked Steve about that and he said, "No, no. I don't want to put that in the book. I don't want to hurt Steve." And I said, "Look, the story's out! It's been published. It's in a book." I had to keep coming back to him for stories like that. They had repeated arguments about things like opening up the Apple II. Steve Jobs didn't think you should have slots — didn't think you should be able to open up the system. And Steve Wozniak felt very certainly that — "I don't know what these slots will be used for, but I bet you we'll find a use for them." And, in fact, that's how the Apple II really took off. All these guys started coming up with adapter cards and expansion boards to put into the Apple II. They're just two guys with two different mind-sets. From a marketing standpoint, you could see why you'd want to close up the system. From a technical standpoint, you'd be nuts to close it up. RU: What other myths are there about Apple, where Woz knows better? Another misconception that bothered him was the idea that he and Steve Jobs had designed the Apple I and the Apple II together. The sole designer of both those computers was Steve Wozniak. The sole designer. And that's not to say that Steve Jobs isn't an engineer in his own right; he may be. But he had nothing to do with the design of those two computers. He was the business guy there. RU: And then there's the myth that it was developed in a garage. GS: It wasn't done in a garage — that was HP. HP was started in a garage several decades earlier but not Apple! Steve Jobs worked in his bedroom of his parents' house and Steve Wozniak was on the kitchen table. RU: I guess some final tweaks were done in a garage. GS: I think at the very end, when they have their first order of a hundred some units; they were actually just popping chips into sockets — some of that was done with Steve Jobs' sister, and Dan Kottke, an early friend. Dan Kottke is a good example of one of the early employees who had everything to do with the success of these first computers — the Apple II, the first personal computer with color and sound. RU: Steve Jobs treated these early employees very poorly. GS: They weren't rewarded. Now, you think if you're at a startup and it does great — Larry Ellison's personal assistant was a billionaire because she was there from the beginning. But back then, employees weren't routinely rewarded like that. So while Steve Jobs and the board of directors all got stock options when Apple was the biggest IPO in a long time — I think since Ford — people like Dan Kottke and the people who really were instrumental in the early designs got nothing. RU: The story I heard is that Wozniak told Jobs that "however much stock you want to give to Kottke, I'll match it." And Jobs said, "Zero." RU: ... his own stock. GS: Right. And those people, and I'm assuming including Dan Kottke, all came out OK. They were certainly millionaires. WB: That's the happiest part of this story, the ethical aspect of who Woz is. When Jobs smashes the Cloud 9 controller against the wall, he doesn't choose to go there. Despite the fact that he doesn't seem to spend a lot of time thinking about social issues; he chooses not to travel into the world of social competition. GS: Steve Wozniak invented the Cloud 9 controller, and it was the first universal remote. This was in the 80s, before everybody had nine things and needed a remote to control. And it was designed also by Frog, another company. And Steve Jobs, I suppose, was furious that Wozniak had used Frog and he smashed it up against the wall. And Steve Wozniak's attitude, always, is... "Whatever. I'm not engaging in this." He is always ethical. And he was very concerned about how Steve Jobs would appear in the book. He didn't want to hurt people. That's Steve Wozniak. He's very kind. There's a kind of innocence there you don't see often among billionaires and millionaires. Everyone has their own viewpoint and selective memory. I’m just guessing but I bet Woz was strictly telling the truth when he said he hadn’t put any salt in the author’s coffee. I bet he tricked her into putting salt in the coffee herself. One thing I’m amazed hasn’t come up in all the reviews of this book is how like Feynman Woz sounds. Down to the conversationalist tone and the pranking – it’s very, very similar. Except that it’s pretty clear that Steve is skirting the truth a lot, where Feynman clearly doesn’t care if he ruffles feathers or pisses people off. If we show our behinds to the audience, everybody is backstage! The WOZ and Jobs are geniuses, but why do they call themselves geeks? In the picture up there, the WOZ didn’t look like a geek at all. I mean, he had muscles! MUSCLES! Doesn’t anybody agree with me? Any way, I was wondering the guy next to WOZ, is he Jobs? HE doesn’t look like a geek either.